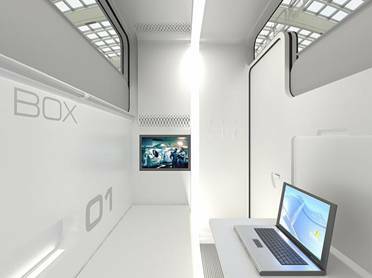 Russian architectural firm “Arch Group” has developed capsule hotels “Sleepbox”. Its futuristic design reminds of “The Fifth Element” film. The mobile 3.75 m2 unit can be located anywhere people need a place to rest or relax. The hotel designed primarily for short-term leisure travellers in airports, train stations and even in the exhibition and shopping malls. Sleepbox is equipped with a ventilation system, sound alerts, built-in LCD TV, WiFi, sockets for a laptop, charging phones and space for luggage. After clients leave the unit, the automatic change of bed linen starts and the quartz lamps turn on. A person can pay at a shared terminal, which provides the client with an electronic key. It is possible to stay in the unit from 15 minutes to several hours.